Does the price of polysilicon (for solar PV panels) depend on oil prices? The assertion that the answer to this question is "yes" was made in an answer to another question here: Which solar power technology has the highest energy return on investment (EROI aka EROEI)?. Note that the poster did not provide a source for either chart, however a quick google image search indicates that they are likely indicative of actual trends. Now, a quick glance at these charts does indicate that the prices seem to track. 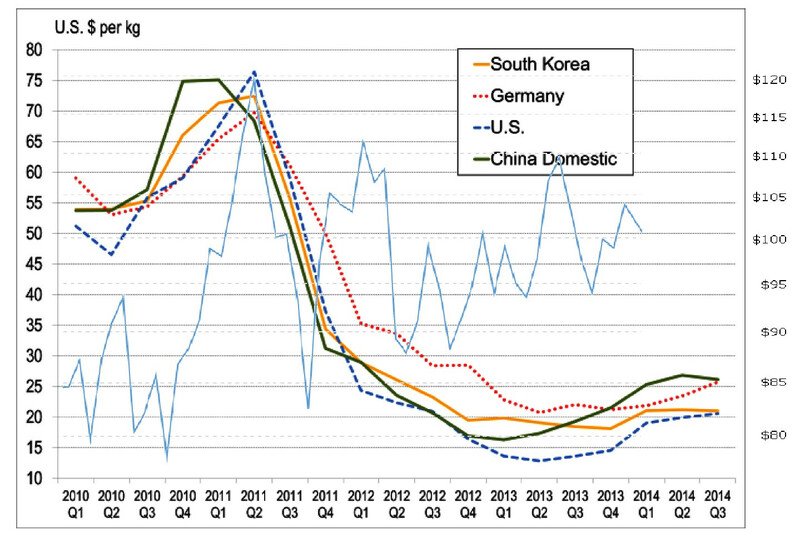 However, the most striking feature is the boom leading to 2008, and the bust thereafter. I am not an economist, but I suspect that historical pricing for any two randomly selected commodities (with the possible exception of gold) would look pretty similar in the years immediately before and after 2008. So, do oil and polysilicon prices actually depend on each other? Are these charts sufficient to decide one way or another? Or is more information needed? 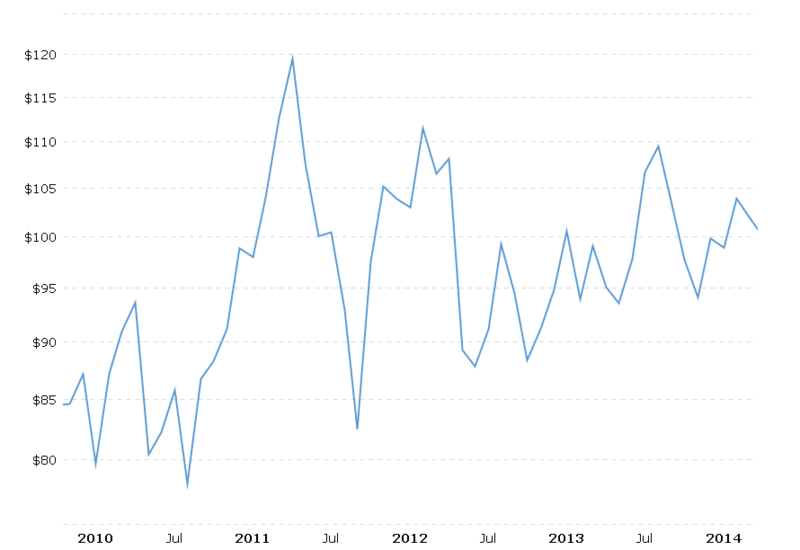 Is there enough data post-2008 to decide if the trend would continue? No. As the graphs provided show, the prices both spike during the GFC, loosely speaking, but the oil price spikes later and declines faster, then continues a general slow rise while the price of silicon falls. 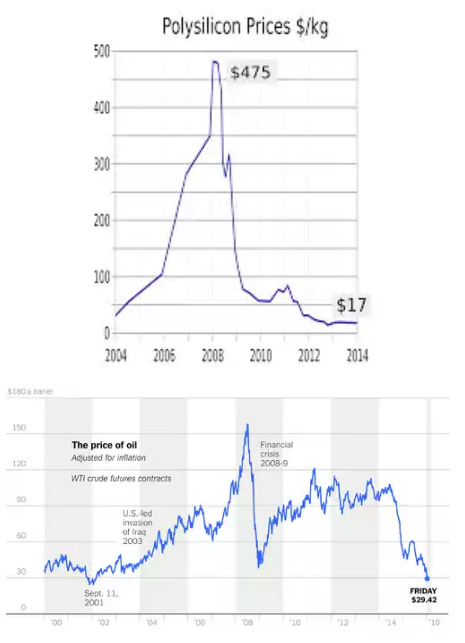 Note that in late 2005/early 2006 oil drops abruptly while silicon is rising sharply, but during the 2011 blip in silicon prices you see a similar blip in oil, possibly. It seems more likely that some external factors affect both prices, but some don't. I took the graphs above, chopped out the relevant section of the oil graph and superimposed it on the silicon graph, stretching it very slightly so that the horizontal scales are the same. This took 30 seconds in an image editor. What the longer time series in the oil graph shows is that the price of oil does not correlate well with any single factor - the Hubert Peak, the GFC, carbon taxes, global demand, they all influence it by varying amounts at different times. The fall between 2014 and 2016 is much discussed, for example, but my impression is that it's regarded as primarily a result of geopolitical power struggles between the US and Russia, but the more optimistic commentators also see some influence from falling demand. At a slightly deeper level, what we're seeing is that by carefully selecting your graphs you can produce apparent correlations between any two factors. 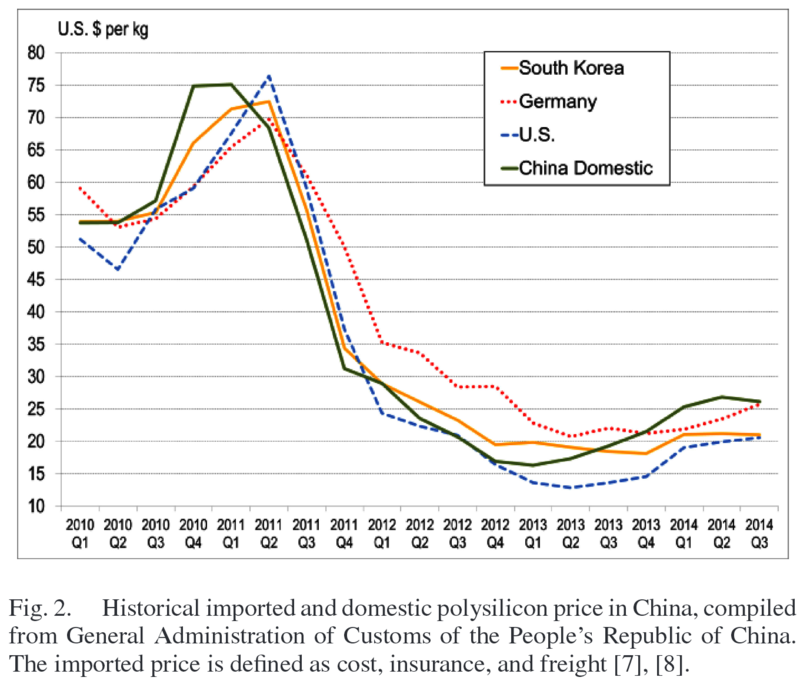 Source: Fu, et al, Economic Measurements of Polysilicon for the Photovoltaic Industry: Market Competition and Manufacturing Competitiveness. Then, crude oil prices since 2010: Source: www.macrotrends.net, Crude Oil Prices - 70 Year Historical Chart. Note that the chart on the website is a log scale by default - I changed it to a standard scale to closely match the polysilicon chart. Based on this, it looks like something in late 2010/early 2011 cause the prices of both commodities to spike - but after that, there's not much correlation at all. Most notably, polysilicon prices are much less volatile. Here's a quick answer; hopefully we'll see some more in depth answers too. 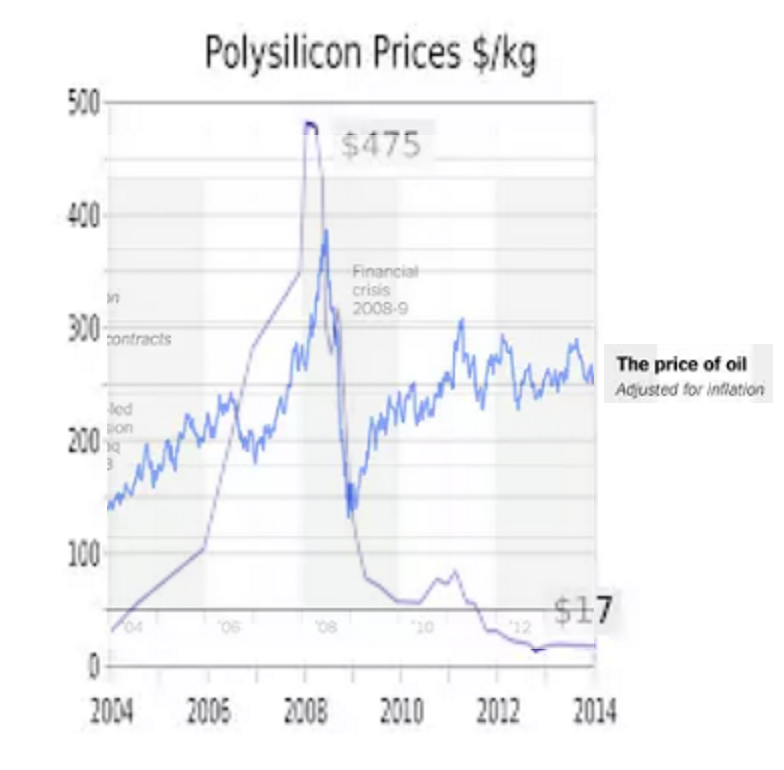 Looking at the given charts closely, the price of polysilicon appears to decline from around $75 in early 2010 to $17 in 2014, but the price of oil appears to gradually rise from $80 to $100 over the same period. This is very different behaviour, and says to me the relationship between the two is very limited at best. Given that the 2008/09 financial crisis involved essentially artificial (ie unjustified) price inflation of commodities (as well as other things), it's no surprise that both charts spiked at that point, and therefore it would make sense to ignore that part of the data to give a more accurate comparison. Not the answer you're looking for? Browse other questions tagged solar-power electricity electricity-generation oil economics or ask your own question. Is the energy used to manufacture and install solar panels in proper balance with the energy output from them? How does one judge the sustainability of using burnt motor oil for termite protection? How does the solar industry fund itself? Can 140 square miles of solar panels power the US?